Hydro-dis® was one of six companies selected to participate in the Water Industry Alliance’s business delegation at the CII Trevini Water Institute’s third Water Innovation Summit. Following the event, Managing Director Mark Carey and a small delegation led by The Honourable Karlene Maywald, the South Australian Government Strategic Advisor on Water Opportunities, attended the Rajasthan Centre of Excellence for Water and Resource Management (RaCEWaRM) meeting in Jaipur. During this meeting agreement was reached for Hydro-dis® to install a Demonstration Unit in Rajasthan, at the women’s hostel located at a University Campus at the Malaviya National Institute of Technology (MNIT). This project is supported by the Water and Sanitation Support Organisation, RaCEWaRM and MNIT. The key outcomes of this installation is to prove the technology’s suitability for the Indian market, with evaluation and testing being carried out to support the trial. The evaluation and testing program has been designed to enable the Hydro-dis® technology to achieve regulatory approval for use in India. The testing program will be conducted under the direction of Professor AB Gupta Head of the Civil Engineering Department at MNIT. This opportunity resulted in Hydro-dis® being acknowledged as the first industry partner of RaCEWaRM. In order to get the most product development material from the unit Hydro-dis® decided to bring forward the next generation of its controllers. 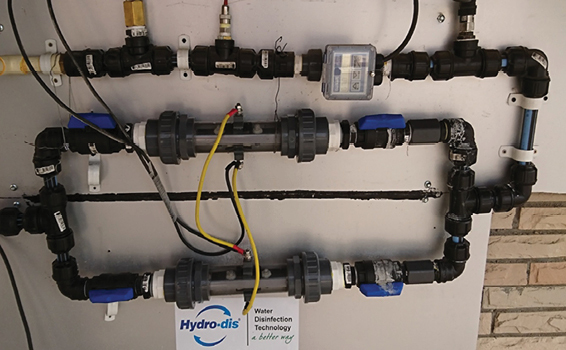 This decision required the Hydro-dis® team and fellow Water Industry Alliance member Dematec to bring all the loose concepts together in a short period of time. This allowed Hydro-dis® to implement full PLC control methodologies with integrated remote telemetry capabilities which allows it to monitor and control the system in India (or elsewhere) in real time. As a result of the trial in India Hydro-dis® decided to fast track the development of its Gen 4 cell configuration. Along with the improved capacity of the design, the company has been able to increase the effectiveness and efficiency of the technology, opening up a broader range of applications. 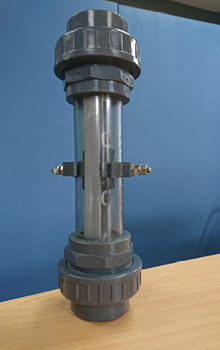 By rolling out the prototype at MNIT Hydro-dis® has been able to maximise the opportunities associated with testing and evaluation offered by the Demonstration Unit being assessed by the MNIT team. The first of the Gen 4 prototypes were installed at the MNIT by Hydro-dis® in mid-December. The installed Prototype Gen4 cells replacing the Gen 3 cells originally installed.